Improved *everybody's* understanding. Literally not a single reference online shows accurately how the e53 fuel supply works until this thread. You have to be prepared for the eventual failure of any mission critical component which is why I have roadside assistance. If you use test six as described above to get a baseline reading of your right tank just as the gauge gets below about 32 L you can know 1000s or 10s of 1000s of miles in advance that your fuel pump is failing. 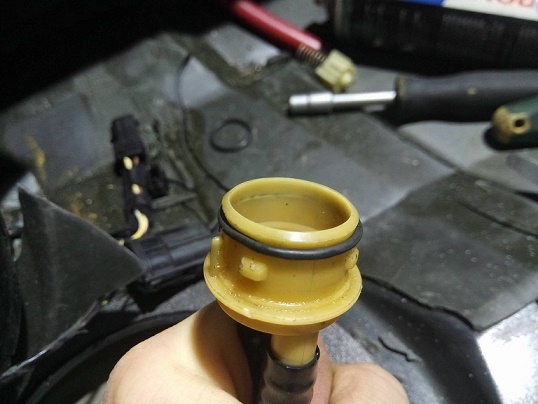 It probably takes a year or two of driving for the fuel pump to slowly wear out and lose the ability to siphon properly. That means at some point your DTE capability will be say 5-10 miles. You may not be able to tell the system it working by simply running down to empty. You also need to check the test six right tank value which should not change from about 32L down to 0L. If the right value drops from 1.4 to 1.1L as the gauge goes from 1/4 tank to empty you can be sure the fuel pump has worn out. Replace it. Also: do a "reality check" using your average mph to get a rough lifespan estimate. Example wife's car I used 22mph and 6000 hours to get 132,000. Amazing since the pump was a few thousand miles into soft failure when replaced at 131400. Use 4000 hours if you use pure gas 6000 if 10% ethanol gas. My car has higher odometer but it has a higher average mph. I will report back when I can record what my cars baseline right tank value is and if it's starting to dip when low dte. Last edited by andrewwynn; 02-14-2017 at 03:52 PM. Excellent thread! I read this thread 3 times to get a better understanding of your observation of the E53 tank design and fuel delivery system. This gives me a better understanding of why we ran out of fuel when the DTE on the display read ~40 miles. I was like, WTF, had the X5 towed to the nearest gas station and she fired right up with a fill-up. I was dumbfounded that could happen at 40 miles DTE. Based on your analysis and the mileage on the X5 at the time (about 150K miles) this all makes sense. We haven't gone past 1/4 tank since this event to be on the safe side, but from what I understand, over time, this may not be good enough as well? Fire up test six and observe the right tank value. At about 32L left it should stabilize at about 1-2L 320014 for example. In my case at about 25L left the right dropped to 0.9L (250009) and made me very nervous so I would refill. Once the pump motor is weak enough that it won't siphon its at high risk for hard failure and I would replace sooner than later. It's about 4/10 level of difficulty and the topsource copy of the pump from amazon is excellent and has a 1 year warranty. It is not likely that the siphon pump failed so I would replace the electric pump and verify the baseline right stays constant. That will verify the siphon pump is working. When you put in gas at a gas station, where exactly does it go? 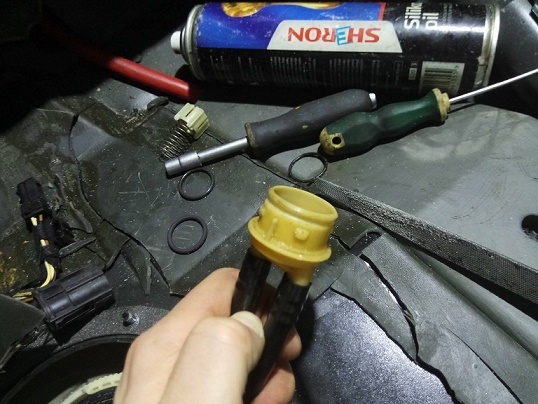 In the first photo, I see a hose that could be this port on the top surface, to the left of center, that would seem to need to fill the left side before anything gets to the right side. Could this be true? If so, would it mean that if you run the right tank dry, then you'd need to put in many many gallons before getting any gas over to the right side where it is needed. And without any on the right side, nothing will pump from the electric pump, so the venturi siphon pump will not come into play. Actually no, the hoses you see are for venting and don't come into play. The fuel neck attaches at the bottom of the surge tank exactly where the fuel pump draws suction. Since this is fuel pump related and I can't find it elsewhere, what is the flow rate of the stock pump at standard rail pressure? 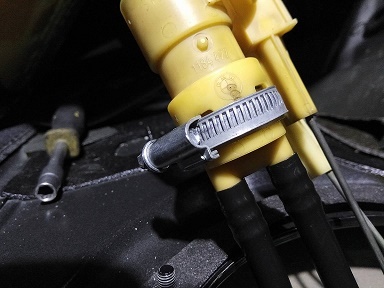 Like all other things fuel system related there is very little helpful information out there. I have found a couple references to the e53 fuel pump that say the volume should be just about half a gallon a minute but that will be at no back pressure. I've seen charts of aftermarket pumps but not the oem one for the e53. I also have no idea exactly how you'd measure the flow rate at pressure. Maybe tapped off the pressure tap on the fuel rail? Maybe somebody that has done a live test can chime in. I think that a pressure test on the return line would be the best way to ensure proper flow rate. The theoretical flow @ 3.5bar doesn't mean much but if the return line to the siphon jets maintains 1.0 to 1.3bar than the flow rate is within spec. Excess flow past the pressure regulator drives the pressure on the return line. When the pressure drops below 1bar time to replace the main pump almost as simple as that. Thanks to andrewwynn for excellent guide. I'd like to return the favor, so I'm adding my engineering results. After replacing the O-ring I got stuck at "
spraying out like a solid morning pee..
couple hours to re-engineer the part to get some o-rings in there and tie the thing back together because the 'only attach once' clips were not planning on holding very long. I thought there must be another way. After half an our of starring at the seam with no seal, it suddenly hit me, if there is no space for a seal, let's make some space for a seal. the rasper used was a triange shaped iron thing on the right side. It was eating the plastic quite easily, be carefull not to rasp a hole into the plastic. as I get longer crank times randomly. Its the second pump gone now, hopefully the last one. Last edited by BlackMW; 12-05-2017 at 11:19 AM. After filling up about : 51.1/ 27.0/ 78.1L (its coherent with the 60 liters I put in). The fuel gauge doesn't go to the top of course. and I haven't pushed it to the bottom (lack of faith). 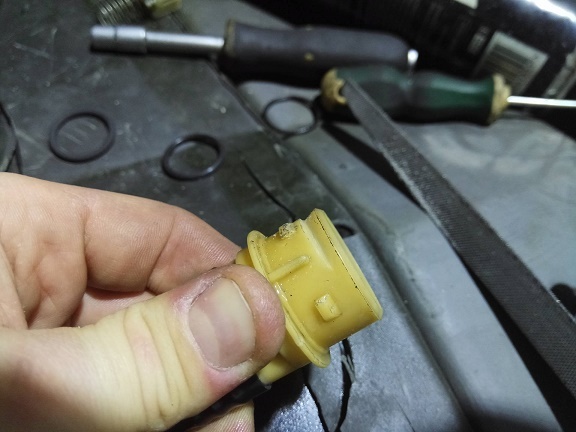 When I bought the car a few months back, it had a fuel gauge that wouldn't work and I replaced the fuel sender (the one without the pump) and found the old one had a broken plate where the floater bar contacts. Do you have an Idea what I should explore or what I should poke at? to remove dirt settled on the resistor plate. and check for mechanical issues if is not bent and moves freely when reassembling. Last edited by BlackMW; 12-05-2017 at 05:55 PM.